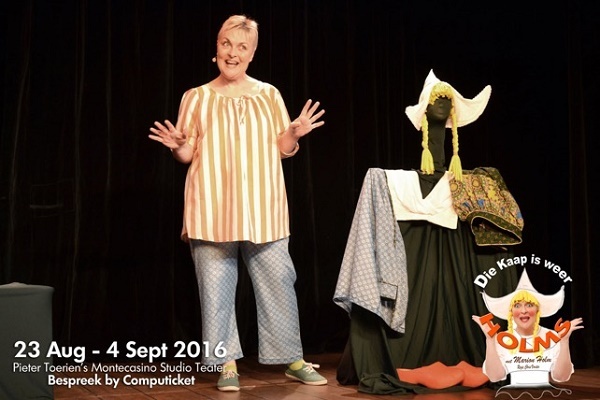 Die Kaap is weer Holms, Marion Holms’ latest show, now on as part of Kosie House of Theatre’s 5 month ‘Afrikaans Season’ at The Studio Theatre is about taking the proverbial bull by the horns and making the most out of your life. Find the things that make you happy and go with that, leaving the other stuff behind. It’s an intimate, personal evening with one of the great story-tellers of the Afrikaans culture. Every tale transporting you to a new place so vividly that you feel like you’re at the waters edge about to embark on the ferry to Robben Island or in the little winefarm workers “husie”, only one of two converted into student accommodation, a little out of town. It’s mesmerizing as she becomes one character after the next with facial expression, posture, accent and all. The physicality of her performance is breathtaking. For me it’s a master class in acting, in story telling, in creativity! She’s one of the best and this production shouldn’t be missed.